There are loads of amazing board games for children available nowadays, so when it comes to choosing one your 5 year old will love, it can be a bit confusing. We are here to help with this comprehensive guide to finding a fun game your child will love. We have chosen over 10 great games to review here, and also have some FAQs to help you make a decision. 0.1.2 Is the game fun for all the family? 0.1.3 Is the game replayable? 1.7 7. Yeti, Set, Go! Because there is such a vast choice of games available on the market, it is important to carefully consider the following factors when making a choice. You need to make sure you are buying a game suitable for your child’s age and know how easy the rules are to understand. Most games come with a suggested age range on the box, and it is wise to follow this. For example, it is unlikely your 5 year old will enjoy a game which is recommended for kids over the age of 8. It will be too difficult for them. On the other hand, you don’t want to choose something which is too babyish for them either, as they will be bored if the game is too simple. Is the game fun for all the family? Choose a game that is suitable for the whole family, so older siblings and parents can all join in on the fun. Your child might want to play their new game over and over again, so don’t choose one you’ll get bored of quickly! When buying board games, look for games that are the most engaging, the games your child would be most interested in. Also look at how long the average time the game will go on for, some games can become a drag and kids will easily get bored. Make sure the game has a high replay value, so it can be played over and over again without getting boring. For example, when playing some quiz games or puzzle games regularly, you will eventually know all the answers! Peaceable Kingdom Mermaid Island is an award-winning cooperative game for ages 5 and up and retails for an affordable price. This game is for to 2-6 players, so it’s ideal for kids to play with their friends, siblings or parents. In this game, players have to work together to help all of the mermaids swim back to the island before horrible sea witches arrive. Pick up a wand to defeat them and if the mermaids get back to the islands safely, everyone wins the game. This game includes 1 game board, 1 sea witch with a stand, 4 wand tokens, 3 mermaid tokens, a spinner, and an instruction manual. This game is perfect for a family game as everyone either wins or loses together. It teaches the children many things with no reading required. Children will learn how to follow instructions, emotional and social development, strategy and how to share. The idea of this game is to play and have fun, it is no competition which means no arguing. Peaceable Kingdom Mermaid Island is highly rated by parents. Connect 4 is a strategy board game for ages 5 and up. It retails for a very cheap price and has hours of fun involved. It is a 2 player game. This game is not suitable for children under the age of 3 due to small parts. It includes two lots of counters, one lot are red, the others are yellow, blue blocker disks and a plastic board. The blue blocker disks bring a twist to the classic game. They block the opponent’s place or lift one of their counters giving you more of a chance to win. Connect 4 is very high quality and a long lasting game. It is a great game for a family night and it also makes a fantastic gift for any occasion. Connect 4 is a brilliant game to keep kids entertained because it is challenging and both players want to win. The rules are simple to learn, which means kids can start playing quickly. HedBanz Junior is an extremely affordable question game for kids aged 5 and up. It is an exciting and laughable game with a brilliant animal theme designed for 2-4 players. Players put a blue plastic band on their head and a card then they have to ask ‘yes’ or ‘no’ questions. The aim of the game is to figure out what animal is on their card. HedBanz includes 24 animal cards, 32 clue cards, 4 headbands, 4 clue card mats, an animal card map and easily readable instructions. This game is the perfect party game and brilliant as a birthday or Christmas gift. It is also a fun classroom game. It helps children with their social skills and improves their speech. Parents highly recommend this game for a family games night. ThinkFun Yoga Spinner Game is a reasonably cheap, award-winning board game for kids aged 5 and up. It is a fun yoga game of balance and flexibility. This strengthens and stimulates the mind. This game includes 54 yoga pose cards, a spinner, and clear comprehensive instructions. This game encourages teamwork to complete a set goal. The aim of this game is to spin the spinner and perform the yoga pose that is on the card. If you are able to hold the pose for 10 seconds, you keep the card. The winner is the first person to collect a card in each color. Parents highly rate this game and say it is a great gift for any occasion. ThinkFun Yoga Spinner is a tremendously fun game with hours of fun and laughter. The Floor is Lava Game is an interactive board game for kids aged 5 and up. This game allows 2-6 players. It is very affordable and the perfect family game. The game is designed to get your kids up and off the couch playing video games. It is an exciting and adventurous way to stay active. It includes 25 colored foam stepping stones, a spinner, 27 challenge cards, and clear, easily readable instructions. The slip-resistant stepping stones can be used indoors or out and make the perfect party game. This is a brilliant and popular gift for a birthday or Christmas and has hours of fun and giggles. Parents cannot rate this game highly enough and say it is ‘great for all ages’. 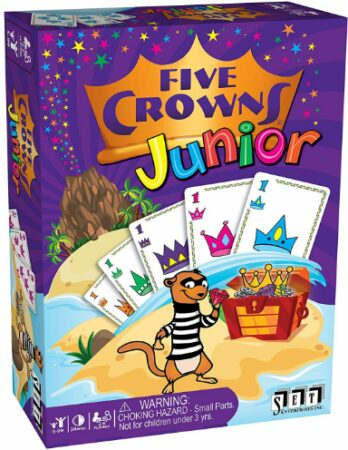 Five Crowns Junior Card Game is an extremely fun, award-winning 2-6 player game for ages 5 and up. It retails for an amazingly cheap price and is currently on sale. This game is made for kids but is enjoyed by adults too. In this game, you begin by flipping over the large wild card and reveal what color crown is wild. The first person to match all 5 cards that are in your hand by color or number, wins a treasure chip and the person with the most chips at the end of the game, wins the game! The cards are great quality and it is a highly recommended game by parents and has hours of fun. Yeti, Set, Go, is an amazingly cheap, cheerful and skillful game for kids aged 4 and up. It is also currently on sale. This game allows 2-4 players and does not require batteries. In this game, you and your yeti are a team. You have to aim the yeti and bop him on the head to start kicking meatballs trying to get them onto the mountain ledges. The first person to land the meatballs on all four ledges wins the game! 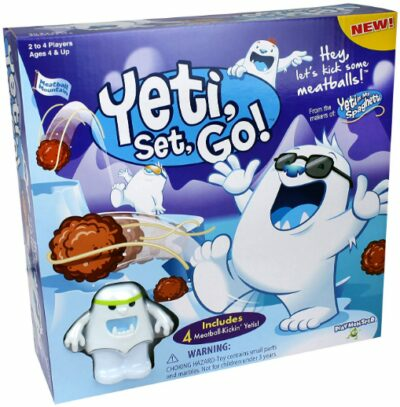 This game includes 4 kicking yetis, 24 meatballs, 2-piece snowy meatball mountain with a center connector and clear, easily readable rules and instructions. Parents say this game makes their kids extremely happy and is full of fun. Yeti, Set, Go, is the perfect birthday or Christmas gift which will keep kids extremely happy. Feelings and Dealings is a card game for kids aged 5 and up. This game requires 2-6 players. It has 24 common emotion cards, 48 expressive cards, and 8 fun games. It retails at a very affordable price and develops emotional intelligence and empathy for players. There are 8 super fun ways to play and covers a wide range of feelings. There are 5 games for therapeutic play and 3 games for educational play. In this card game, there are 48 cards. 24 of which show a child expressing emotion and the other 24 are social scene cards in a realistic social situation. Each individual emotion card matches with a social scene card. Kids will discover different emotions from basic emotions to complex emotions. Parents highly rate this game and it is a great game to get your child socializing. This game is also a perfect classroom game to help young children understand how others are feeling. 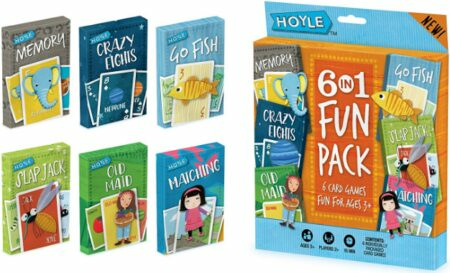 Hoyle Kids Fun Pack is a different range of card games for kids aged 3 and up and it retails at a super cheap price! There are 6 different card games with fun graphics. This game is for 2+ players and can be played within 15 minutes. The card games include games such as ‘memory’, ‘old maid’, ‘Go fish’, ‘crazy eights’ and more! Each game has an individual theme and is super quick and easy to set up. This pack of cards are great long-lasting quality cards and exceptionally easy to play for young players. This is the perfect card game to keep guests at a small party or dinner entertained and makes an exceedingly good gift for any occasion. Children will learn how to play and interact with each other nicely. Brain Freeze is an award-winning educational game for kids ages 5 and up. It retails for an affordable price and helps kids learn strategy, logic deduction, and memory. The game also focuses on being able to follow multi-step directions. It encourages taking turns, problem-solving and speech-language skills. 2 players race to guess the sweet treat that the other player has. You have to use your strategic thinking and memory logic until you correctly answer the opponent’s sweet treat. If you guess the wrong answer, you get a brain freeze! This game includes 2 secrecy shields with stands, 2 dry erase pens, 2 brain freeze grid boards, 2 dry wipe clothes, and a rule book. Brain Freeze takes around 15-20 minutes to play depending on the age and skill level of the child and is a fun concept that may make you hungry! Parents highly recommend and rate this game and it makes a great gift for a birthday Christmas. 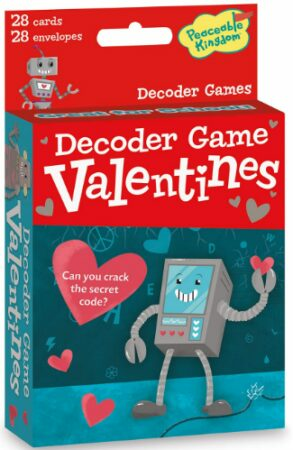 Peaceable Kingdom Valentine’s Decoder is an affordable decoder game for kids aged 5 and up. It retails at a reasonable price. Each robot card includes a secret Valentines Day message and the cards are great quality. The aim of the game is to crack open the code. They are perfect for giving away at a Valentines Day party or disco and are for both boys and girls. Giving away Valentine’s Day cards is a great way to socialize and express gratitude towards other people such as their friends and family. It is also a very thoughtful gesture. This game includes 28 envelopes and 28 robot decoder cards and 3 special and unique designs. Playing board games can be very beneficial to your child. Below we will discover some of the wonderful benefits playing games can bring to your child. 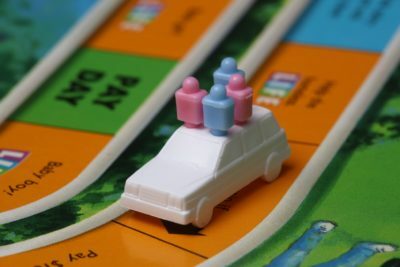 Playing board games allows you to have more family time. It is an excellent way to get people together and strengthen your family bond. Kids will love spending time with you having fun and not sitting in front of a screen. Games allow parents and children to enjoy more quality time together. When you are a parent, you are extremely busy and a board game is a nice way to sit down and interact with your child. Games reinforce social skills and teach children how to share and take turns. It also teaches them how to work as a team and that a game is not all about winning. These are important and valuable skills to learn from an early age. There are many educational advantages that board games bring. They can improve lots of different skills including fine motor skills, math skills, their thinking skills and many more. They increase brain function and they teach children about their actions and consequences. Board games challenge kids to make tough choices and think ahead. Finally, games improve cognitive skills and memory and they help children focus for longer periods of time. Many factors were considered when it came to choosing the best games to review here. Read on below to find out why we chose the games above. All of these games are 100% family friendly and are highly rated by parents. They are the top board games for 5-year-olds and have hours of fun and laughter ahead. The instructions are elegant, very clear and comprehensive and the games do not have lots of small pieces to put together so they are quick games to get started. These games teach kids that it is not all about winning and that it is ok to lose. It also teaches them how to play fairly as a team. Some of the games are cooperative which means teamwork is even more important. Of course, all kids will enjoy winning but playing fun games can help them accept losing as they have had fun playing the game and not just winning it. These board games are very educational and full of fun. Each one offers an opportunity for your child to learn a new skill or practice an existing one. Finally, all of these board games are excellent value for money and are long lasting and high quality.